Meath. Hill of Tara, Navan. Tara was the seat of the High Kings of Ireland, dating back to 2000 BC, see http://www.yourirish.com/history/ancient/high-kings/. It is hard to fix where myth ends and historical figures begin, however, but their powers were broad-based and provided for annual gatherings, public works, collection of taxes, providing for defense and emergency, and legal judgments and setting laws. Standing stones: a famous one is at Tara. See others at Standing-stones-jhwh-flip-flopper.html, an overview of Biblical, other ancient, and modern, standing stones. The Tara complex consists of burial mounds, depressions representing old roadways, structures, aerial views of patterns in the earth, concentric circles, and may be one of the most photographed areas in Ireland. http://www.uni-due.de/DI/Architecture_Art.htm. But it also is one of the most frustrating because the Christian world coopted on (piggybacked) ancient ways, the Christians tried to Christianize the old religious, royal and civic sites, to the diminution of both ideas. It is hard to get a photo of the main event without also a cross or other Christian thing entering in. On the cut-off side here of our photo of the primary standing stone, this obvious phallus-obelisk form so common in the world (Washington Monument anyone? ), is a cross. Take the cross away. It has no place here, even if you are St. Patrick. This is great Tara. So we did. We cut out the cross entirely. Good. Better. Now, take away the church sitting up there like a fish out of water. The Flight of the Earls in 1607, from the Lough near Londonderry, changed the landscape literally in Ulster. The Ulster area then included Donegal. All the lands owned by these hereditary, historic clan leaders went into escheat, to be redistributed by the English to its own settlers and Lords, see the Battle of Kinsale that fixed the English victory at Cork, see http://irelandroadways.blogspot.com/2006/09/kinsale-dublin-and-cork.html. And so, families like ours have ties to many cultural roots, with questions: where there are Scots-English-Irish forebears, with the same name, who was where, when. Were our Donegal people part of the Plantation, even though Donegal itself never became colonized. Or were they there on their own, Protestants in a sea of Catholics. Who was our first? When? Aunt Edna, once-removed (?) says that McConaghy's appear as far back as 1617 in the Hall of Records kept at Belfast, but that may be just one of many. Or not. FN 1 for Aunt Edna J. McConaghy's family recollection (everybody rather unwise). There are many spellings of McConaghy, however, from Mac to Mc to all the rest. Who is connected? The family, some, is still there. Donegal also offers a window to WWI, in a family living there -- the father and husband later killed in the Great War. The City of Londonderry is part of Londonderry County, not Donegal County, but the areas to us on the outside do seem to blend. See census Maurice Edwin McConaghey and Family, Londonderry 1911: here the chart does not transfer, but the words show the categories later written out. killed at Arras, France in 1917. It appears that we cross three lines of Irish: others with more information, please update. 1. Indigenous or Plantation McConaghy's (various and creative spellings, including Gaelic); and Hildyards-Hilliards, and whether those all were part of the Plantation or were some pre-existing in the area; and including (see The Scottish Clans), MacDhonnachaidh, Campbell of Inverawe; and Duncan, in Gaelic, Donnchadh, from Donn meaning brown adn cath, a battle. Brown warrior? MacConachie in Gaelic is that MacDhonnchaidh, or son of Duncan. The Clan Donnachie are the Robertsons of Athole, so named from Duncan de Atholia. Robert. In Gaelic, Raibeart, Rob, from anglo-Saxon Robert or bright fame, and so, Robeetsons, Clan Donnachaidh. 3. Normans, became landed gentry (invaders, after William the Conqueror took England 1066? ), the Norman Briens, William de Brien (Brian, Brienne), Knight,[see 1390-1395 petition to the king re inheritance rights, lands of Guy de Briene in England and Wales; and Gerard son of Brien, 1161-1182 at St. Thomas Priory, Stafford; Staffordsire; and Stoke-on-Trent, England. See UK National Archives (a cousin, Dorothy, is researching and may do a book, so all this is just a whetter]; Briens subsequently at historic house (still a house) Glengeen Lodge, 61 Killyfuddy Road, Trillick, Omagh, Co. Tyrone, William Brien 1846-1916, my grandfather (Kilskeery Parish Cemetery, Kilskeery). Hilliards and Briens: Trillick - Gaelic Fri Leac, for three stones; another Hilliard sibling to my grandmother has surfaced in Canada, cousin Dot in touch. Status of other MacConachies (as the name was often spelled then for our family)? Some were in the 1688 Siege of Londonderry, Siege of Derry, with 10000 probably Plantation "settlers" and Protestant soldiers defending against Jacobite Catholics besieging, while Protestant William of Orange landed in England to challenge King James II, behind Derry's walls. Jacobites: supporters of King James II; Irish Catholics and French supporters, see http://www.orange-pages.tk/The%20Siege%20Of%20Derry.htm; that McConaghy involvement noted by our family research Elder, Violet, letter February 9, 1977. The MacConachies had been "planted" there as part of King James' Protestant "Plantation" policy, we think, but need documentation. At any rate, they were in the Siege. Violet, where did you find that? Early MacConachies also spelled the name McConnaghy). Most of the family moved to the Convoy - Raphoe Valley. By 1822, a census by a Rev. Wray of his flock, now (I believe) near St. Johnston, Donegal. That is near Strabane, on the Tyrone side. And now, Old Matilda and her son James were (1977) still in Donegal, Ronald is a retired army major living in Yorkshire, England; Chistopher with two sons lives in South Africa, and his brother John and their mother in the then Rhodesia, Paddy is in Belgium, Michael is an army major in England, and others are in Canada. More in Australia, earlier moves there. Typical family tree. Any family will straddle several areas later divided, that once were "one." And so with the McConaghy-McConaghey group, over three counties and a long border: Donegal, Londonderry or Derry, and Tyrone. The name Derry stems from Daire, a Celtic word for oak grove. See its older history, long predating Christian influence, at http://www.geographia.com/northern-ireland/ukider01.htm. For a good start on the Celts, see http://tdbcelts.org/node/599, and the book, The Celts by T.G.E. Powell, see http://www.amazon.com/Celts-Ancient-Peoples-Places/dp/0500272751. Notes of a family researcher are at FN 1. A place so rooted does not take easily to forced change. Sacred things happened in oak groves: Rituals, trees, significance that resisted usurpation by later institutional-oriented Christians, the Augustinians. Earlier, more meditative Christians, perhaps even Columcille (521-597 AD) or Columba, and the contemplative groups predating Patrick, fit in more easily and established a monastery there. However, with the Augustinians and especially after until 1100 or so, with the Gregorian reforms reaching Ireland, there was new regimentation and an aggressive taking over of the old sites. Regimentation and rules, the big monastic orders following Rome. And then, the British colonists "planted" in Northern Ireland, the Plantation, necame ensconced for defense behind walls at the city. The Scots and British built defenses around their claim, their Protestant ways and loyalties to England and Scotland an affront to the Irish Catholics whose Ulster lands had been left leaderless after the notorious Flight of the Earls, see http://www.bbc.co.uk/history/british/timeline/civilwars_timeline_noflash.shtml, and English takeover. Its history is beyond us. Londonderry Air is part of us all. Hear at http://www.youtube.com/watch?v=-Jgma--0WYU. The walls are there, stop, park, walk. But don't forget to listen. Any destination and interest beats mere touristing. Pick one and follow it. The border areas of Ireland may well just be a tourist destination for some, but others of us have people from most all of its evolution. The divisions between unionists, seeking to perpetuate union with the United Kingdom, and nationalists, seeking the independent Republic of Ireland even to include the six counties of the north seeking union, is embodied at Derry. FN 1. A cousin, Dorothy, is preparing a full geneology, so I will only put here what seems most interesting. In particular, history question. With the Flight of the Earls, where the Ulster holders of escheated land, left for Europe; and left Ulster untended, leaderless, its lands up for grabs -- which the English promptly filled -- how much of the older holdings remained? Any? Did the Earls control it all, or were others also landowners, indigenous protestants as well as indigenous catholics. Many of the names Mc and Mac and O' have Gaelic forms, suggesting the earlier connection. Is that so? Then, is our McConaghy derived from the Robertsons or the Campbells? "Tell Jim that the McConaghys came from Straban in Tyrone County, Northern Ireland. His great-grandfather and great-great grandfather were Presbyterian ministers there. Bill McConaghy [my uncle, brother of my mother Marjorie McConaghy] went there when he was in Ireland and the present (or the then present) minister took him all around and showed him the countryside. He went through the Hall of Records in Belfast , and said he noticed the name McConaghy mentioned as far back as 1617. As for papa's father (papa=James Torrens, papa's father = Robert McClure McConaghy), he was the elder of two sons and his father insisted he was to be a minister and as a matter of fact I understand he was graduated frojm the University of Edinburgh as one. However, he never wanted to be a minister and would never take a church. "As he inherited from his mother's side (whose people were in the linen business) [mother=Sidney Torrens] enough money to lie on, he actually never worked at all. After he died (in New York by the way about 1897) it was found that he had used up all his money and Grandmother McConaghy (Sidney Torrens) was left with nothing. She had always lived with her brother and sister, (Will and Margaret Torrens) who really brought up the six boys in Ballyfatten, the Torrens home. Unle Joe and papa, together with their Uncle Will Torrens, came over here in 1888, and landed in New York during the blizzard of 1888. They had a hard time getting to the boardign house where their father was staying. Uncle Robert and Uncle Harry came over shortly after, and then in 1902 when grandmoter's sister died, Uncle Will went back and brought her over with Uncle Sidney and Uncle Allen (Sidney is the female grandmother b.1850, and also the son Sidney b. 1874, the brother of my grandfather Robert McClure McConaghy b.1876, for you scorekeepers). "As I recall the tales, Grandfather McConaghy's father insisted he study for the ministry because he was the eldest son. His younger brogher studied medicine and had a practice in London. Grandfather gadded about the globe on money inherited from relatives. (The stories were that he would have inherited additional monies from members of his family if he had not been so contentious and constantly picked arguments with his relatives.) By the time he died in New York he had exhausted the money. Frances Hilliard age 54 d. 1924, sister of Margaret? Robert McConaghy age 49, grandfather, 1926 heart? Louise McConaghy, my grandmother, age 87, d 1963. "Grandmother Sydney McConaghy only lived at 2662 Decatur Avenue in the Bronx, until she went to live with Harry and Dora in Rahway, N.J. I have no ide of the birth dates of the uncles. I have listed them in order of their age. "All the Joseph McConaghy family are buried in Catholic cemeteries (why?). Grandfather Roert lived in a boarding house on East 33rd Street in New York, and I think it is town down for an apartment house." This ring fort is near Castlecove and the town of Caherdaniel, see http://www.sneem.net/staiguefort/ No mortar was used for this large undertaking, still standing. Dating perhaps from the first through the sixth century BC, Celtic period, it was a defense site, an observation post, and perhaps other uses -- copper is in the area. See http://irishantiquities.bravehost.com/kerry/caherdaniel/caherdaniel.html. The history of Irish peoples, those arriving by migration, invasion or happenstance, or already here, is a complex one: dark complexions are not unusual and have a variety of explanations, see the Black Irish at http://www.ireland-information.com/articles/blackirish.htm. Vikings, where the word for "dark" (dubh) was often used in conjunction with "gall" or foreign, see site discussion of dark also used as to intentions (thus blond Norse as dark)? Descendants of Spanish traders, populations passing through Spain, such as ancient Milesians, even with origins in Middle East. Legends blend. 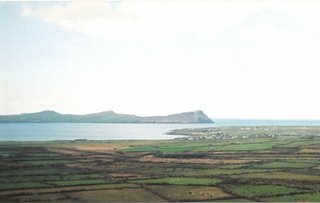 The town of Dingle voted in 2006 to reject adoption of an Irish-language version of its name, An Daingean. 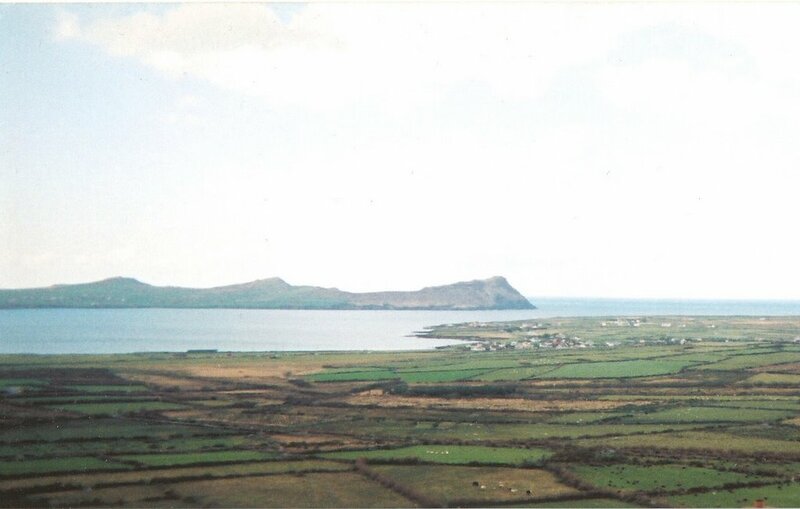 Instead, residents chose a bilingual name, Dingle Daingean Ui Chuis. The town is in a "Gaeltacht" area, where Irish, the old Gaelic is frequently spoken. These areas receive special grants and government allowanes for residences, educational facilities, clubs and fairs to promote the speaking of Irish. See http://select.nytimes.com/gst/abstract.html?res=F60716FB3D5B0C728EDDA90994DE404482&scp=1&sq=Voters%20in%20an%20Irish%20Town%20Reject%20Edict%20on%20Language%20of%20its%20Name&st=cse. In 2004, some 2300 communities were required to adopt the Irish names. Back in 1824, the English used on its maps Anglicized versions that stuck. Blasket as a place name does not sound Gaelic, and some speculate it comes from the Norse for "a dangerous place." Hardship, sacrifice, isolation, rough conditions for farming potatoes, oats, and having perhaps a cow and donkey -- all a part of life there, and the population was further diminished with the famine, see http://www.blasketisland.com/briefhistory.html. Some 150 people lived there in 1840, now it is abandoned except for donkeys that still live there. The Great Blasket. See http://irish2009.mka.org/?m=200906. For a narrative of the loss of an island culture, some sites recommend this book, :The Blasket Islands: Next Parish, America", by Joan and Ray Stagles, http://www.irishbook.com/history/the-blasket-islands-next-parish-america.html. Is this similar to The Aran Islands, by J. M. Synge? See that online at http://www.gutenberg.org/ebooks/4381. Great-grandfather William Brien of Glengeen Lodge, Trillick, is buried at Kilskerry. What do these words mean, the components of Irish place names. Fast forward to "kiil" or "killy" as church. Go further. 1. Irish place names: Go to http://www.irelandstory.com/geography/placenames.html and find that although there have been centuries of Vikings, Anglicizing, changes. A place name may be completely Norse, for example, like Dublin. Also see a larger list at http://www.fionasplace.net/irishplacenames.html. We have listed the ones we found most useful from both sites below. The best for a download, with full sample place names provided, is the fionasplace site. 2. Merely taking an English spelling and going to a dictionary may not lead to the correct Irish meaning. Irish place names are usually descriptive, with multiple components. If there are two lakes, for example, says the site, the larger lake area may have "-more" appended. The smaller, "-beg". Gaelic words can sound alike, however, so find an expert in Irish dictionaries. While you are there, look up the old Ogham Script, see http://www.ancientscripts.com/ogham.html, patterned slashes or lines read bottom to top on stones, right to left on manuscripts. Bally, or Ballyna or Bally means Place of. This is not the same as "town of" as the towns came later. Down-dun-don - fortified place. Downpatrick. "Kil" or "Killi" - church. Donegal. Heritage. Place Names. Meanings. Matthew McConaghy 1780 on. Are They Still There. Part I of family heritage Sites. How can they enrich anyone's history. Milestones of history. Scots "Risings" occurred in 1688, 1715 and 1745 spurred much immigration to Ireland from Scotland unrelated to the Plantation. These took place in Scotland after this McConaghy branch began living in the North of Ireland. Our people apparently did not come to Ireland because of the "Risings". It was earlier, at the Plantation? From there on, it remained business as usual to move back and forth, family ties, Scots universities. Events in Donegal, Londonderry, the rest of Ulster, have deep roots, even in prehistory with the first Ui Neill, and ultimately the flight of Hugh O'Neill as part of the 1607 Flight of the Earls. His lands were redistributed to the English and other settlers. We are trying to find if our people were part of the Plantation, or there on their own. "*** Due in part to its wildness and inaccessibility colonists proved reluctant to attempt settlement. In addition, Sir Arthur Chichester described its native population as a "people inclined to blood and trouble". In 1619, Pynnar recorded of estate after estate that nothing was built and that there were no British tenants. [According to] one historian ... : "it was the pluck, skill and tact of hard-bitten, experienced soldiers such as Sir Henry Folliott and Sir Basil Brooke, that held Donegal quiet and so gave protection to the infant colony". Tracking family in Donegal, then is uncertain, as to loyalties of any generation at any time. There is a difference between claiming Scots and English heritage, since the original "Scots" were Irish back in the day; and being part of a Plantation-extension. We are sorting it out. 3. Geneology and ladies' names. Matriarchs disparu. Patriarchy carries with it discriminations against others that, if pressed against men, would not be tolerated, and never had to. Men's names carry on with the property inheritance ramifications as that evolved; women disappear with their birthnames. And she did all that work bringing into the world five surviving sons for husband Matthew to take credit for. Matilda. No birthdate, no death date. She is forgotten. Was it her property, that Greenhills, that passed to Matthew with the marriage? No idea. Matthew lives on because his surname survives the system, and he had five sons carrying it on: David, Robert, Joseph (from whom we spring), John, Alexander, his name attaches easily. The name "Matilda" does recur, however, see St. Johnstone. Matthew is supposed to be buried at Raphoe Churchyard, but no stone is now to be found, although it is noted in son David's will. II. Place Names. What can we learn from the Places? Place names are listed with forbears in much family tree research. The Gaelic is interesting because "Gael" or "Gal" means "foreigner" or stranager. Donegal would be fort of the foreigners. The word comes from pre-Gaelic people who referred to the later Celts as foreigners or "Gaels". See http://www.irelandstory.com/geography/placenames.html. This ties the Gaels in with the Gauls, and is that the same time period as Caesar pushing the Gauls out of Rome's way? What were these places? With schools not teaching history and geography, start with your own family with your own children. 1. Matthew McConaghy 1780 or 1785. We see no Celtic or Gaelic in that very English name. So, green hills. "*** In 1609 the English mapped out 4,000,000 acres of land and started gaving it out in 1610. Counties Down, Monaghan and Antrim were planted privately. Counties Derry and Armagh were planted with English. Counties Tyrone and Donegal were planted with Scots. Counties Fermanagh and Cavan were planted with both Scots and English. The vast majority of the settlers were Scottish, as it turned out, and they brought with them a new form of Christianity, Presbyterianism, which was different from both Roman Catholicism and the Church of England, although it is classified as Protestant. They also brought new farming methods and a Puritan lifestyle. This made north-east Ireland culturally very different from the rest of the island. ***"
But see Parliamentary Gazetteer of Ireland Vol 3: p. 112. Raphoe was the name of a County, a Diocesan seat (we understand as to a Presbetery, but was it Episcopal? See also http://www.libraryireland.com/topog/R/Raphoe-Raphoe-Donegal.php,, That the area used to be called "Rathboth" . Raphoe is a barony, an old Gaelic designation, property area designation, see Rootsweb, and http://www.ballybegvillage.com/land_division.html; and a parish, and a post and market town. See again FN 2 here. Greenhills: Greenhills - that turns out to be a house. It is "the last the [sic] residence of W. Fenwick, Esq." and one of three "seats" of a diocese -- of the Presbetery, we understand. Raphoe as an ecclesiastical site was founded in the 9th Century by a St. Eunan, a/k/a Adamnan, see http://www.bartleby.com/210/9/077.html, and http://www.newadvent.org/cathen/01135c.htm; long before the Roman branch of Christianity asserted its supremacy against the Irish Christians in the 11th-12th centuries. He also was a biographer of St. Columba, Columcille. How to find, out of dogma evolved since then, a real Eunan, or is there no difference. The evolution of Christianity's focus from early contemplative Irish, free-wheeling, individualized; to the Roman regimentation is seen in architecture as well as dogma. Rome focused on "crucifixion" and "cross." Raphoe: After diminution of the Irish Christian contemplative tradition, there was a Roman-type institutional bishop here in 1203. St. Columba's work earlier was not necessarily to be seen as a monastery, as we think of those institutions; because he was not an institutional Christian. But apparently he founded some ecclesiastical setting. Rome shoved all earlier forms of Christian followers away, with its high centralization and conformity. In came Dominicans and Cistercians and centralized bishoprics took over, accountable to Rome, not the indigenous, local population structures. 5. McConaghys at Greenhills, Raphoe. Digging deeper. Matthew's son, Robert, a farmer of Carrickbrack (carrick means rock in Gaelic, see http://www.irelandstory.com/geography/placenames.com) , Rooskey Upper. He married a Margaret Allen of Greenhills. What? Greenhills was supposed to have been Matthew's place, where, with one Matilda Gray, he had the five sons including Robert. Robert at the time was to have held 13 acres at Raphoe, and 30 acres at Kiltole. This was the homestead, as we would call it, of the first McConaghy we can document so far in our line -- Matthew born about 1780. Crests may establish the line. This McConaghy group that for us started at Raphoe - Convoy is not related, as was previously thought, to the Scots McConachie - Robertson group. The name McConaghy is not that common, but here the crests are different. The Scots McConachie is "hand with crown". This Matthew McConaghy a McConachie, us, (Matilda! Wife of Matthew! speak up!) has a crest that is different: comprised of the top half of a Scots male figure, not just hand with crown; and with a plaid over one shoulder, holding sheaf of arrows pointing down. The motto is, "By these we shine." C. Tullydonnell Lower, 72 Acres. David son of Matthew. Tulach means knoll, http://www.pbenyon1.plus.com/Misc/Etymology.html. There also is Don - Celtic brown, or Dun fort. Donail Daniel. Tullach Donail, Daniel's Hill. Count five such names of Townlands (Townland: see FN 2). One is Tullydonnell Lower in Donegal. D. Ardvarnock Glebe, 40 acres. Glebe: a church "furlong" (measure of an area) or parson's "close", property of the church for the parson's residence, farm. Ard means a high place, Gaelic. This can be physically or in terms of status, importance. Ards peninsula, County Down, Some "Ard" words, however, are abbreviations of Atherdee, and Dee is the river. See Irelandstory site above. Kil means a church, Gaelic. See also Kilkenny, Kildare, this from irelandstory site above. My mother was Marjorie McConaghy. What does the name mean? Robert son of Matthew owned this property that sounds like it [cannot find this property]. Hee is apparently in the Gaelic dictionary from Manx. http://www.onelook.com/?lang=all&w=hee&loc=nophr; and http://www.visitisleofman.com/culture/; but seems to be an archaic form of "he". Marghera is part of Venice, including port, refinery. Rev. John, a son of Matthew, married in 1841 the daughter of Robert Torrens of Ballyfatton Cottage, Strabane. She was Elizabeth Cunningham, born 1813, died 1898. Bally means "place of" from the Gaelic 'Baile na'. See irelandstory site above. It does not mean town. Few towns existed went the names attached. Ok: Place where animals were fattened. Now Fatton is a common surname. Owner of the feedlot? Rev. John and Elizabeth Cunningham had seven children: Elizabeth, Sarah, Margaret - married William McCrae, lied at "Grange", Willliam [became surgeon general, India, married Mary Birdwood], Martha who married her cousin, Matthew Allen 1861, John IMS India 184901907, buried at Exmouth, and Robert James MD? This also was the home of James Torrens, Urney, father of wife of Robert McClure McConaghy, Glengeen Lodge, Trillick. Questions. Why do we focus on the bloodlines of the male. Where is the bloodline of the female, Matilda Gray, wife of Matthew McConaghy? We, for the detective in us, are setting up obscure posts for the lost women in geneologies. Robert MClure, Rev. b.______; m. Sidney Torrens, June 6, 1870 in SION MILLS, TYRONE; Sidney is daughter of James Torrens of Urney, BALLYFATTON COTTAGE. Farm. 5. Alexander b. 1822 0r 1823?, died March 13, 1889 (stone); married? 1. Provinces. There are four: Ulster (North); Leinster (East); Connaught (West); Munster (South). These are named from the ancient kingdoms Uladh, Laiaghean, Connaught, Mumha. There had been a fifth old kingdom, Meath, but that merged with Leinster. Two other old kingdoms, Aileach and Oriel, were integrated with Ulster in the 17th Century. King John's basic twelve: Dublin; Kildare; Meath; Louth; Carlow; Kilkenny; Wexford; Waterford; Cork; Kerry; Limerick; Tipperary. Add Longford, Clare, Galway, Sligo, May, Roscommon, Leitrim, Armagh, Monaghan, Tyrone, Derry, Condgal, Fermanagh and Cavan in the reign of Elizabeth I.
Wicklow was carved out of Dublin County in 1605. Note that some towns have the same name as the county: Dublin, Limerick, Cork. These stem from ancient Gaelic land holdings. There are now some 325 baronies. In the 19th Century, the English turned these into civil divisions for the purpose of land valuations. These could be ecclesiastical (Dioceses?) or civil or both. In the 19th Century, the civil parish was used for land valuations. The civil parish was generally smaller in size than the ecclesiastical and often had a different name. There are about 2002 civil parishes. Townlands were small rural divisions of the civil parish were called Townlands. An average size may be some 350 acrea. In 1901, there were some 60,462 such townland areas. In 1838, the Poor Law Relief Act was passesd, dividing the country into Unions or Districts where "local rateable" people were to be responsible financially for the care of paupers there. A Union may be a multiple of Townlands, perhaps with a radius of some 10 miles (estimate). One market town would be designated as the Center, and there the Poor House would be located. These are frequently still seen, but used for different purposes. Our lists of land holdings are larger than we anticipated, so this site is now limited to Donegal. Tyrone land holdings or references will be at a Tyrone post. Non-McConaghy's, those not of the 1780 Raphoe MatthewMConaghy line here, are in FN 1. Early named slaves from Ireland include Patrick - as in Saint Patrick. Irish raiders are credited with snatching him from Wales, the College of Theodosius, Llantwit Major, in the territory of Cernyw, see http://www.historyfiles.co.uk/KingListsBritain/GaelsHighKings.htm. Enslavement has long been a respected and usual way of asserting supremacy, in a way that helped make ends meet, and disiposed of otherwise rebellious defeated opponents. Slavery in old Great Britain and Europe, Rome, Vikings. Slavers. Read the stories, many online, and read the letters, the primary documents as available. Find Irish slaves in the Caribbean. A. Irish Slaves in the Caribbean. Is Forced Indenture the same? Were there both? Could all the "indentured" work their way to freedom? 1. The Battle of Drogheda, near Dublin. Siege of Drogheda. Where did it lead? Cromwell's order. The traditional stories of Scots slaves in the Caribbean is familiar. Less familiar to non-Irish (but a favored topic for many Irish, see http://www.trisranch.com/id82.html) is Irish slavery. It is also documented, is slavery - including the involuntary indenture - of the Irish. There were extensive abductions - forced transit to the Caribbean. Irish came to Jamaica one way or another, some voluntary, in the 1600's, see Jamaica Gleaner, at http://jamaica-gleaner.com/pages/history/story0058.htm. Each century seemed to bring more impetus to subjugate the Irish, the initial time period being the 1100's; and from that original Anglo-Norman invasion, to its repercussions: brutal perpetuation of English control of Ireland. 2. Why the vehemence, the absolute refusal of the Irish to accept subjucation in their land, fight so strongly against overwhelming odds, as at Drogheda with Cromwell. Follow the historic roots of a global human issue: unjust assertion of power. Has the Irish sense of injustice and anger at their overlords, got a stronger, real historic root, more than most. Where profit-making religion itself is the pretext for injustice, is anger the greater. Should the Irish ask for reparations from the Vatican? Idea, idea. 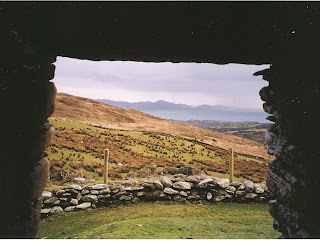 The ancient Milesians first laid claim to Ireland, see the Bard Amergin at http://www.amergin.net/songofamergin.html. And, in time, the Normans and Catholic Gregorian reformers. "For, although authors generally write that the Emperor Constantine, after his baptism, bestowed the islands of western Europe on Pope Sylvester, that did not give the Pope possession of Ireland, since no emperor that was ever in Rome, nor Constantine, had possession of Ireland. How, then, could there be any force in the right which the emperor might give to the Pope, to what was neither in his own possession nor in that of any emperor that succeeded him since?" Devorgilla. The role of the lady in the invasion of Ireland by the Normans. Thou hast signified to us, indeed, most beloved son in Christ, that thou dost desire to enter into the island of Ireland, in order to subject the people to the laws and to extirpate the vices that have there taken root, and that thou art willing to pay an annual pension to St. Peter of one penny from every house, and to preserve the rights of the churches in that land inviolate and entire. We, therefore, seconding with the favour it deserves thy pious and laudable desire, and granting a benignant assent to thy petition, are well pleased that, for the enlargement of the bounds of the church. for the restraint of vice, for the correction of morals and the introduction of virtues, for the advancement of the Christian religion, thou shouldst enter that island, and carry out there the things that look to the honour of God and to its own salvation. "And may the people of that land receive thee with honour, and venerate thee as their master; provided always that the rights of the churches remain inviolate and entire, and saving to St. Peter and the holy Roman Church the annual pension of one penny from each house. "If, therefore, thou dost see fit to complete what thou hast conceived in thy mind, strive to imbue that people with good morals, and bring it to pass, as well through thyself as through those whom thou dost know from their faith, doctrine, and course of life to be fit for such a work, that the church may there be adorned, the Christian religion planted and made to grow, and the things which pertain to the honour of God and to salvation be so ordered that thou may'st merit to obtain an abundant and lasting reward from God, and on earth a name glorious throughout the ages. " Christianize this "island of Saints" that was already Christian, after Patrick and other early Christian monks' works? It was already Christian, see http://www.exclassics.com/ceitinn/for57.htm. Just not "Roman" branch. 3. What was Irish enslavement like. Those who served their indenture then could establish themselves as planters and settlers; with the last shipment of Irish in the 1800's, some 30-80,000 were estimated to have arrived: many in their best clothes, and bringing their habits with them., see the Jamaica Gleaner site. There were also Irish slave owners. 4. How was it accomplished. Oliver Cromwell, see http://www.british-civil-wars.co.uk/biog/oliver-cromwell.htm, was Lord Protector of England in 1655 - Article "Green Genes" clipped back in 2000 from a magazine that foolishly does not identify itself on the pages other than JULY/AUGUST 2000 and pages 54-58 (author Mic Moroney - check that - we saved that does not give its title. "a recruite of a thousande men, and a supply of younge Irish girls" and others with no "settled course of industry"
"the younge women, although we must use force in takinge them up, yet it beinge so much for their own goode .. you may have such number as you shall thinke fitt..."
"Barbados had become a destination for military prisoners and Irish natives in the early years of the colony's growth. Oliver Cromwell "barbadosed" any Irish who refused to clear their land, while allowing other Irish to be kidnapped from the streets of Ireland and shipped to Barbados as slaves. Many West Country men were also exiled or "barbadosed" by Judge Jeffreys and were also sold as slaves or indentured servants to British planters, where they lived in slave conditions with no control over the number of years they had to serve. "The number of "barbadosed" Irish is not exact but estimates vary from as low as 12,000 to as high as 60,000. Persecuted Catholics from Ireland also worked the plantations." Invaders for thousands of years have plucked off slaves from Ireland - Rome included. The Irish and the Norse have a long history in this regard. Norse slaves were booty from raids beginning about the 8th-9th Centuries or so, but also included as a category those debtors who were working off debts, bondsmen, see http://www.hurstwic.org/history/articles/society/text/social_classes.htm/. Saint Patrick himself, born in Britain and Christian, was enslaved at age 16 and sent to Ireland. See http://www.nytimes.com/1993/03/15/opinion/st-patrick-was-a-slave.html. He escaped, went to Europe and ultimately back to his family in Britain (via a pirate ship seven years after?) see http://news.nationalgeographic.com/news/2009/03/090316-st-patricks-day-facts.html/ Slavery - a fact of life for millennia. Read the National Geographic article to find how little we know of Patrick, and if he did much of anything at all, and consider the cultural needs of people to embellish, to personify, and the stories grew. Another topic. C. Malcolm, the Irish Thrall. Iceland. Slavery in the 900-1100's or so. Icelandic Sagas. Find an overall database at http://www.sagadb.org. For the Irish connection, look at one Norse saga in particular from Iceland, Burnt Njal's Saga, http://www.sagadb.org/brennu-njals_saga.en. These events transpired at a time that precedes the Norman invasion of Ireland or Strongbow. This is the era of the Viking raiding in Ireland, a tale from Iceland. This is not a story of any raiding, but rather of a community over time in Iceland, occasional trips back to Oslo, but essentially families, fighting, values, persons. Malcolm, a slave or thrall from Ireland, features in the ancient Icelandic Saga, Burnt Njal's Saga. Njal was a wise counselor, chief, among other chiefs, legally astute, a pillar who was killed, burned with his family inside their own house, all ruined, by those who had a grudge, insults had accelerated, honor became involved, and revenge, do read it all. his brother Hallbjorn who owned Malcolm. 2. Malcolm the Irish Thrall did not work well for his master, Hallbjorn. Master may not be the quite-right word, because in those days, the slave worked in a relationship with the owner, and there had to be give and take in the household. These were not plantations. Malcolm and another member of the community, Hallbjorn's brother Otkell, developed a better relationship than Malcolm had with Hallbjorn. So Otkell bought Malcolm from Hallbjorn. Hallbjorn was relieved at that. He scoffed that his brother Otkell was getting no bargain. And sure enough, once bought by Otkell, Malcolm the Thrall started to slack off again. Then it was Otkell who had bought the lemon, who wanted his money's worth. How better than to pass off Malcolm onto someone else. So Otkell targeted and schnockered another member of the community, Gunnar, into buying Malcolm. 3. Now, Otkell himself was no gem. His behavior shows that Otkell was greedy and tight-fisted, in a culture that required sharing in bad times, for the community to survive, the me-first mentality of Otkell was not respected. Gunnar, on the other hand, had been generous with his stores whenever he had enough for his own household, and some left over to share. He was well respected. He shared with others, he could expect others to share with him if he should need. So when Gunnar, in another season ran out of necessities, he came to Otkell. Otkell himself had plenty. He had enough left over from his own stores, after meeting his own needs, and could well have sold some to Gunnar, and times were hard. Yet he refused to share with Gunnar. A bad play. 4. Enter Njal, the hero of the overall tale. Njal, community leader by agreement, respected as the good, and the wise, the just. Njal himself then provided hay and meat to Gunnar, earning Gunnar's loyalty; and firming up the disgrace of Otkell. Enter Gunnar's wife, Hallgerda, the wife of the one that Otkell had turned away. She is another fierce figure. She is a saga revenge-seeker. Hallgerda maneuvers Malcolm, now part of hers and Gunnar's household, into going back to Otkell's house and stealing food and burning the storehouse, and threatens him with death if he will not obey. Chapter 48. 6. What is a poor slave to do? Malcolm does as he is directed (he is only a thrall) and steals from Otkell, but he is found out. Here it gets interesting as to consequences. There is much ado about not punishing Malcolm or Hallgerda, but resolving the matter with monetary awards, negotiated. And that is done. No incarceration, no execution. Just pay, and pay. 7. The law appears to be a civil one: make the injured party whole again by taking money from the evil-doer, but don't incarcerate or execute. Not clear, but that is how it looks. Sagas are a window into cultural practices, beliefs. Note that in Njal's Saga, the justice system of the Norse was not an eye for an eye, but a value compensation placed on goods and lives.There was no moralizing about an injustice - just pay out. Is ours any better where we impose religious right and wrong by divine edict on people? This Thrall Malcolm is not the same as the Scots king Malcolm, of the same name, see Chapter 82.